Go to your local sporting goods store or thumb through any hunting catalog. When you get to the deer scents section there are probably more than a few choices. Knowing which scent to use for what time of the year can leave even the most experienced hunters scratching their heads. Some hunters stay away from scents altogether for fear of using the wrong scent and blowing the chance of harvesting that great trophy buck. The truth is that when used properly, scents can help tip the odds in a hunter’s favor. Bowcast.com recently posted a great podcast about the proper use of scents. Anthony and Aneal spent some time talking to Steve Lambeth from Code Blue Scents. Lambeth does a great job of really breaking down which scent to use and when. Get your pen and paper out and take down some notes on this great interview. If I had a dollar for each time I’ve been duped by a giant whitetail buck, I’d be able to afford an entire hunting lease that would stretch from Iowa to Ohio! Sometimes when chasing after a bruiser buck, no matter what you do or how you do it - nothing goes right. Mature whitetails are mysterious in each and every way. They survive by instincts and past experiences. It is the small faults we make that add up to full-fledged mistakes. This past week I archery hunted in Buffalo County. I had hung a set of stands a few weeks ago in a prime travel corridor, which leads deer straight from a thick bedding area to a vast cornfield. I call it the, ‘swamp stand’. The best characteristic about this location is that it’s untouched by human litter until late October and November. It is one of those hotspots I leave alone until the rut begins to escalate. Friday afternoon I had to make a choice—whether to hunt the swamp setup or wait until Saturday evening. The wind was ideal for both of my setups I had in mind. It was literally decided over a flip of a coin (my deer license actually). A few hours later I found myself sneaking into the swamp stand with an I-60 Game Spy cam in hand. After hanging the camera and performing my ritual scent-minimizing practices, I crept out slowly. I couldn’t wait to see what I was going to miss out on. I climbed into my perch, which looked over a few acres of cornfield and backed up against a small creek. It was a place I had struck a few deer with arrows in the past. Friday evening’s hunt yielded with only one deer sighting. A yearling doe tempted her taste buds on a few ears of corn. It was as if the movement suddenly shut right down. I couldn’t wait to see what my trail camera photographed in the swamp. Saturday afternoon I snuck back into the marsh to retrieve an evening’s worth of deer pictures. My camera snapped twenty photos in only a period of a single evening and morning. I smirked, cringing with a rush of anxiety as I transferred the pictures from the trail camera directly to my laptop. It was official - I was reluctant to win another dollar for my ‘pity-bank!’ My I-60 photographed an impressive 145 class 9-point buck three times throughout the evening. The most upsetting thing was that he was captured during daylight, with my tree stand hanging in the background. Needless to say, I hunted the swamp Saturday and Sunday with no luck at all. A handful of does and squirmy yearling bucks pranced down the trail and in front of my Moultrie, instead of the big buck. As one buck vanishes another one appears, at least that is what I hope to happen. I will be solely directing my focus on him or another one of his competitors as the breeding season kicks in. I wish everyone the best of luck. This experience reminded me of the old saying; “I’d rather be lucky than good any day.” Let this be a learning curve for some of the acrobatic equations a buck will spit back out at you and shed light on their unpredictability. Once again, I was at the wrong place at the wrong time. What is This Follow Up? In last week’s blog entry, we posted a photo of a somewhat odd looking deer sent in by Robert in Hudson, Wisconsin. We asked our readers to chime in and let us know what they thought was wrong with the deer. Sadly no one did. We emailed the photo to Stephen Ditchkoff, an associate professor of wildlife at Auburn University. Ditchkoff helped clear up what was going on with the deer. He said that the swelling in the deer’s belly was more than likely caused due by an abdominal injury or tumor. The day after we posted the blog, Robert sent in another photo of the deer that his scouting camera captured at a different angle. This, along with Ditchkoff‘s diagnosis, quickly put out rumors of a 5-legged, pot bellied deer. What would your course of action be if you ran across this fellow in the woods? Would you take him out of the gene pool? This weekend was pretty discouraging as far as trying to manage our property and grow a quality whitetail buck. My parents own a little 50-acre piece of property that we refer to as “The Farm.” I live within just a few minutes of The Farm and am there several days a week. My father and I work all year planting food plots, trees, and doing everything within our means to attract and benefit all of the wildlife that we possibly can, especially the deer and turkey. For the most part, the other property owners around us try and do the same thing by letting the younger deer walk and trying to be somewhat selective about what they shoot. Of course there are still a few trigger-happy people on a couple pieces of property that think there is a never-ending supply of deer. Though these guys like to shoot everything that moves, it is legal and they have permission to hunt on the property. The ones that I have a problem with are the guys that do not have permission to hunt, ride the roads and try to shoot deer out of a truck window. This story started back in the early spring when I started getting Game Spy photos of a bachelor group of bucks. I got photos of these bucks just about every week through the summer. There was one buck in particular that from the early stages of his antler growth you could tell that he was going to have a pretty good rack. Once he had a full rack it took me about three weeks to get a really good photo of the deer to get a good look at his rack and try to determine how old he was. The smaller bucks with him would always get right in front of the camera, but this buck would be in the background of the picture or he would always have his head down feeding. Eventually I placed a camera on a tripod in the middle of the food plot that he would hang out in all the time and got some good broadside pictures of him. After going through all of this to get his pictures, I nicknamed him “Slick.” Once I was able to get a good photo of him, I determined he was a three-year-old with a really nice eight-point rack. It was exciting to have a deer like this living on the property and even more exciting to think what he would look like next year. I saw Slick on several different occasions after hunting season opened and kept getting game camera pictures of him about every week. It was really hard not to shoot this deer. For the area that I am hunting this is a better than average buck and some people would consider him a trophy. I just wanted to see him after he had one more year of age on him. I got a call from my dad last Friday and he told me he was at one of the food plots that we call the salad patch. There was a really strong smell coming from the creek. He told me it smelled like something was dead. I walked down to the creek he was talking about Sunday afternoon and he was right, there was a real strong smell in the area. I made it down the creek about 50 yards and walked up on Slick. It appeared that he had been there for several days. The last picture I got of him had been about a week and a half before I found him. He was lying in the creek about 150 yards straight downhill from a road that borders the west side of our property. It looked as if someone had shot him from the road and he made it to the creek. I appreciate you guys listening to me vent, but I just had to get this off my chest. We as hunters spend our time and hard earned dollars trying to make things better for the deer that we hunt. Though we are doing all this to ultimately kill them, we still love them too. When we hunt them it is done legally and ethically. I wish that the people who do things like this would think about this before they blatantly have disregard for other people’s property and hard work. Every one dreams of killing a true monster buck. One Iowa hunter has done just that. Check out the picture on the Boone and Crockett Web site. This hoss sports 28 points and grosses in the 270s. In a recent blog posting on October 22, Mike Hanback shares some things that you need to do if you are ever fortunate enough to harvest such an animal. Last weekend I drove to Buffalo County, WI to check images on a few trail cameras I had placed along some heavily-used deer trails. The cameras were set, baited and left untouched for an entire month. My anticipation for a few incredible snapshots was high, which is usually the case when I’m in the woods doing anything related to hunting. I love to think positive and hope for the best! I typically set a camera parallel to a surefire deer trail. Oftentimes it takes a longer time than expected to find a perfect tree to accompany your trail-cam - it’s no different than locating the ideal tree for your tree stand. It takes a lot of decision making and problem solving. I always spray the unit’s outside body with a scent-eliminating spray to minimize odors. Using rubber gloves for installation is another necessity. After everything is pre-visualized to what I at least hope to happen, I spread shell corn or mineral around the area to draw in game. There’s been word and sighting of a slammer non-typical buck that would easily score in the 160’s bravely stomping through crop fields at dusk. He’s been eluding hunters time and time again along the adjacent pieces of the property I hunt. I’ve never seen the buck personally, but he’s getting his share of fame, whether he knows it or not. I learned that pin-pointing a buck of this caliper is extremely difficult. A mature deer’s uncanny ability to alter its pattern of movement, change routines on a daily basis and suddenly go nocturnal is all too familiar. I felt as if I had the hunting premise under a security lockdown - three cameras on each end of the 200-acre chunk would hopefully catch the ol’ boy red-handed! I inspected each camera yesterday. Surprisingly, each memory card was chocked full of pictures and video. I figured there would be at least one solid buck snapshot I’d be able to take home and fill my dreams at night. I’m saddened to admit that I had received zero photographs of him or any trophy class bucks for that matter. There was one picture in particular that caught my eye though! On October 14th, during the midnight hours, my Moultrie scouting camera snapped a picture of a gigantic bodied deer sporting a less impressive set of antlers. After examining the picture on the computer, I was able to zoom-in for extreme detail. The 5-point buck, tipping the scales easily over the 200-pound mark, appeared to be well over 4 ½ years of old. His blocky-styled face, saggy front chest and swaying belly directed attention to his age and maturity rather than antler size. I’ve never seen this buck before, which was kind of neat! He definitely lacks trophy genetics, but his wily characteristics helped him survive over the past few hunting seasons. As November approaches and the whitetail rut blasts, be ready for anything. Just because I didn’t have any pictures of trophy bucks, doesn’t mean I’m officially out of the game. So don’t be discouraged if you’ve experienced the same. Remember, bucks are beginning to roam; there truly isn’t any telling what will show up on any given day from now until the end of November. Welcome to the wondrous world of whitetail. This photo was recently sent to us by Robert from Hudson, Wisconsin. The photo created quite a stir around the Moultrie office about what was wrong with this deer. Post your thoughts about the deer’s ailment and next week we will share what a local biologist believes is going on with this deer. It started raining this weekend and not the kind of rain that gets you wet. I am talking about the round and hard kind that falls out of trees, also known as acorns. Until this week there had not been a lot of acorns dropping, and hunting the hardwood ridges had been slow. Wednesday afternoon I hunted a hardwood ridge that I hadn’t been to all year. It drops off the backside of an 8-acre field that we use as a dove field. There is a lot of volunteer wheat in the field that has been attracting deer to the area. The side of the field that I was hunting is bordered by a stand of hardwoods that drops off into a creek bottom. I climbed a tree in the hardwoods where I could still see the field. It was raining acorns in the hardwoods, and the ground was littered with acorn caps and deer droppings. I got in the tree about 4:40 PM and I started seeing deer around 5:15pm. The first deer were two does and a couple of fawns. They came to the wheat field first and then worked their way to the hardwoods. After that, the deer just kept coming and before the night was over I think I saw ten or eleven deer total. However, they were all does and I can’t believe that there was not one buck with all those does. Thursday afternoon I went to another ridge that has a lot of hardwood trees. This ridge is one of my favorite areas to hunt. It is a beautiful stand of hardwoods with a 10-acre pasture on one side and pond on the other side that makes a perfect funnel for the deer. I figured that the acorns would be dropping here, too. Well it didn’t take me long to realize that I had guessed right because this area had plenty of acorns also. About 5:20pm I had a two big does and two fawns again. I thought the does had one fawn each, but then I saw both the fawns nursing on one doe. I realized how old the doe that was not nursing looked. She had a head on her that looked like a mule and was too fat to have been nursing any fawns, so it was time to do a little QDM (Quality Deer Management). After all the time I have spent in the tree this year and have still not let an arrow fly, I was definitely getting an itchy trigger finger. With an old baron doe like this coming in range I didn’t need a better excuse to let an arrow fly. As the doe moved toward me scuffing up acorns, she offered me a perfect 15-yard quartering away shot. With a well-placed arrow tucked in behind her left shoulder she didn’t make it out of sight. After we got her out of the woods and taken care of, she weighed 130lbs and we estimated her to be 7 to 8 years old. This is a perfect example of a deer to get out of the herd if you are trying to manage the areas you hunt. I have been seeing a lot of does this year but most of them have been young or have had fawns with them, and I don’t like to take the mother away from them too early in the season. Though I didn’t see any bucks on those two hunts I know they are around somewhere close because the does are there. With the rut approaching, everybody knows where the does are the bucks won’t be far behind. 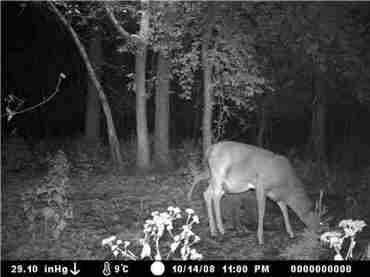 Plus I have been getting a lot of buck activity at night on my game cameras. In Scott Bestul’s October 13, 2008 on Whitetail365 blog post he talks about a monster buck that Ben Spanjers was able to harvest. The 8 ½ year old buck had avoided hunters for many seasons. With the help of game cameras they were able to pattern this old buck and finally harvest him. Do any of you have a deer like this that you have seen in person or on camera and has yet eluded you or other hunters for several seasons? Let us know! When I scout a hunting property, whether it’s one I’ve hunted for years or a fresh piece of ground, there’s nothing more helpful than an aerial map. Aerial maps will give you a bird’s eye view of the terrain, shapes, features and characteristics your property holds. Enhancing the visual aspects of what types of attributes your ground possesses will aid immensely throughout the entire season. I prefer using maps to locate deer travel routes in a broad perspective. You can easily locate funnels, fingers and pinch-points by simply analyzing forest and field features. Another benefit is locating water sources. Water plays an important role early in the season and also during the rut, when bucks are in full-blown chase mode. Making a short drive to your local courthouse is another way to attain an aerial map. All it takes is a few simple question of where the land is located and sometimes they are able to print a map onsite. Otherwise, they will send a map to your home address within a reasonable time. This option is fairly quick, cheap and painless! You are able to customize the size and dimensions of your map and have them laminate it for you. It is just another great way to physically see treetops and field shapes from the clouds. Thanks to the World Wide Web, we are now able to fly around not only our entire state, but also our whole planet in the luxury of our chair! Through the Internet, aerial maps can be pulled up in no time and at no cost! I use this time-efficient method almost every week. A program called Google Earth, www.earth.google.com, shows defining terrain features and allows you to zoom into properties from the stars, literally! It is easy to download onto your computer system. Another web site of interest is www.maps.live.com, which displays even more detail, in my opinion. I can virtually locate the exact tree my stand is hung. This has opened a new platform in technology for the hunting community. This program allows you to mark tree stands, flag deer trails and label as much material as you want. Technology has brought many great products over the years; much has been at the tip of our fingertips. I urge everyone to spend an hour studying the property you hunt, because I promise that you will gain a better appreciation and knowledge of the lay of the land. Walking a property is one thing, but sitting in the convenience of your home and pulling up a web site that shows you a totally unique perspective of it is another. Try one of the listed web sites today; I am sure you will be glad you did.